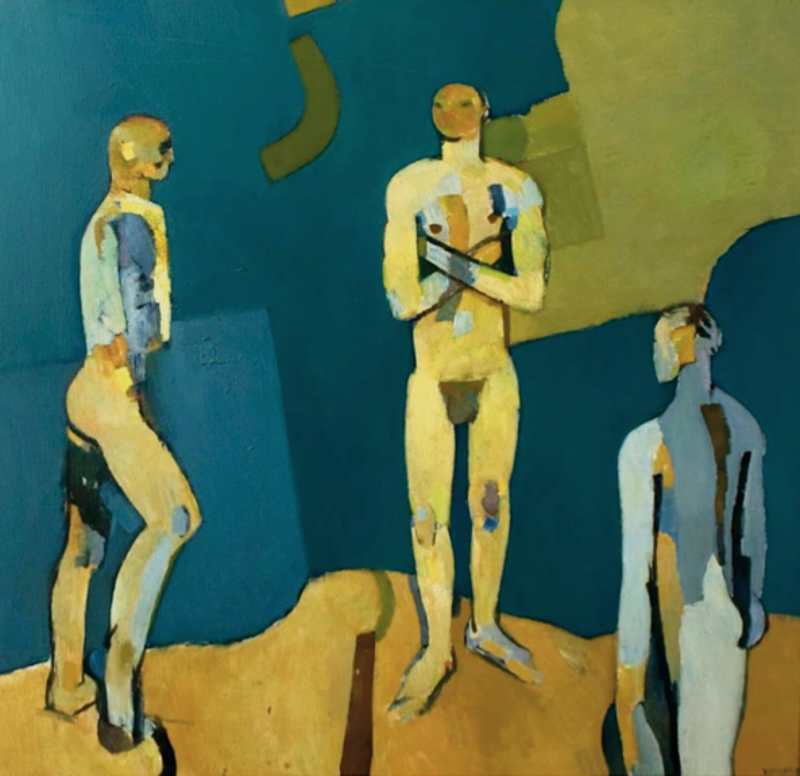 Figure Against a Blue Background was closely linked with another painting of the same period, now in the Nottingham Museum, originally titled Transfiguration Group (now Fourth Assembly of Figures). Subsequently I altered the title of both paintings to remove any religious associations, which were never intended. Although Vaughan was a confirmed atheist, he was interested in the manner and style in which religious subjects were represented. The various solutions that early Italian painters evolved to convey complex spiritual meanings, intricate narratives and intense human feelings, were qualities that he wished to emulate in his own large-scale figure paintings. Something of this approach may be detected in the composition of Fourth Assembly of Figures (Transfiguration Group). We recognize echoes of Duccio’s Transfiguration (a panel from his great Maestà of 1308-11, in the National Gallery), as well as other earlier Christian interpretations found in icons and mosaics; Vaughan employs comparable intervals and tensions between the figures. Moreover the crossed arms of the central figure and the stately, ceremonial nature of the other two, further implies such connections. Each is carefully arranged and presented so that one appears in profile, another frontally and the other in a three-quarter pose. The figure at the right appears to be entering the scene, walking into the picture space from the viewer’s world to approach the others. Similarly we stand opposite the central figure and completing the group and closing off the arrangement.